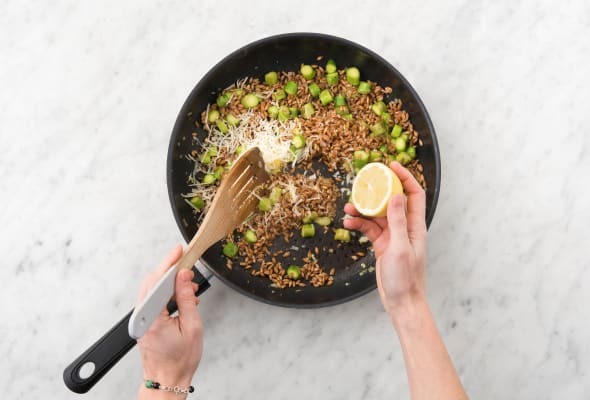 Farro has had something of a moment lately, becoming a favourite grain of chefs and home cooks alike for its nutty flavour, addictively chewy texture, and high-fibre content. Prep: Wash and dry all produce. Bring a small pot of salted water to a boil. Cut the asparagus into 1-inch pieces. Thinly slice the zucchini into 1/4-inch rounds. Mince or grate the garlic. Zest, then cut the lemon into wedges. Toasted the walnuts: Meanwhile, heat a large non-stick pan over medium heat. Add the walnuts to the dry pan. Cook, stirring often, until golden-brown and toasted, 3-4 min. (TIP: Keep your eye on them so they don't burn!) Set aside on a plate. Char the zucchini: Increase the heat to medium-high heat. Add the zucchini to the dry pan. Cook until golden-brown, 5-6 min per side. Transfer to a plate. Cook the asparagus: Decrease the heat to medium heat. Add a drizzle of oil, then the onion and garlic. Cook, stirring occasionally, until the onion softens, 4-5 min. Add the asparagus. Cook, stirring occasionally, until tender-crisp, 4-5 min. 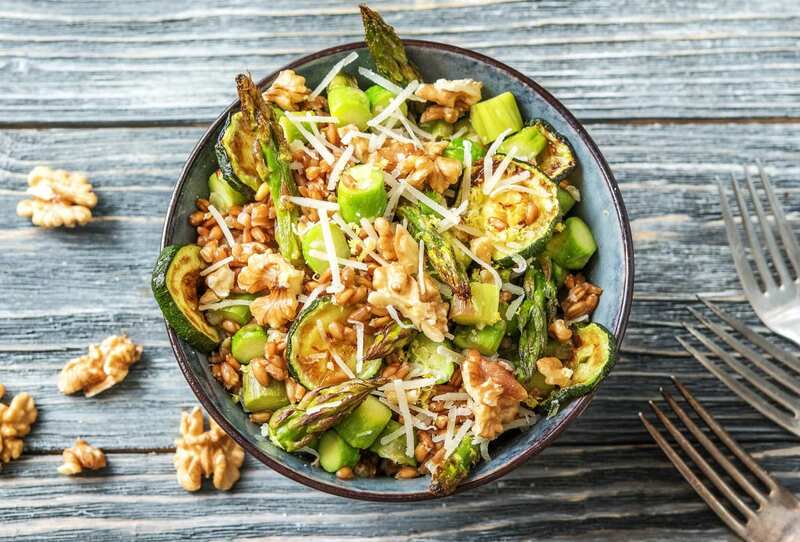 Add the farro, zucchini, butter, lemon zest, squeeze of 2 lemon wedges and half the Parmesan to the asparagus. Season with salt and pepper. 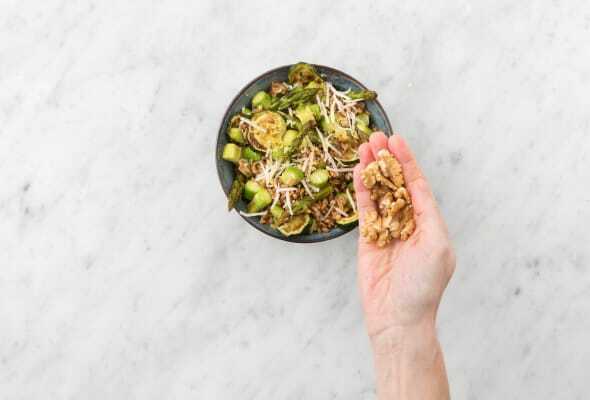 Finish and serve: Divide farro mixture between bowls. 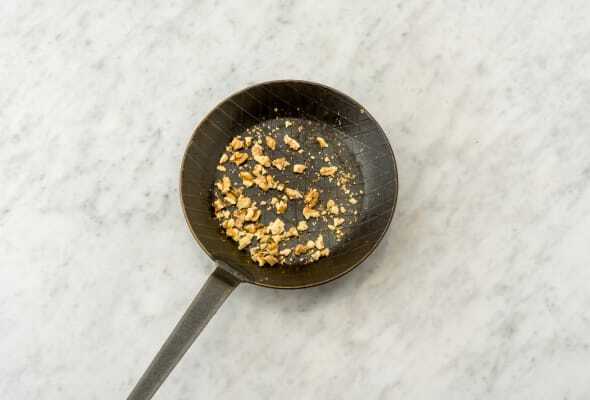 Sprinkle with the toasted walnuts and remaining Parmesan. Squeeze over the remaining lemon wedges and enjoy!